I have to admit the Winter Olympics were never high on the list for me. This year's games had very little appeal as well. I'm more of a Summer Olympic fan. Give me track and field, boxing, basketball, fencing (well ... maybe not fencing) and I'm a happy guy. 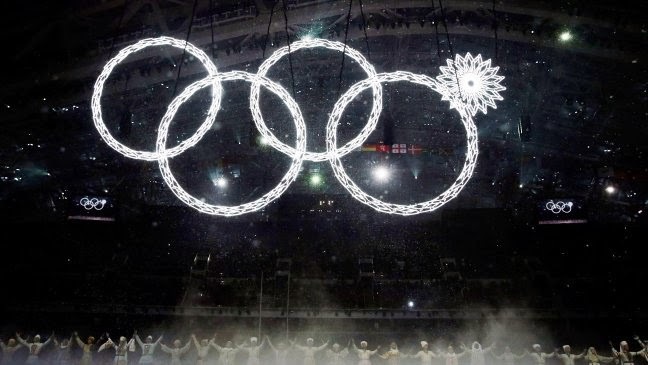 Now ... the screw up on the rings for the opening ceremony had possibilities. THAT was good television. Buy unfortunately, that was the only highlight I enjoyed. 1. Curling. This is not even a sport is it? Brushing the ice while a skater slides a steel teapot looking thing toward a target is as exciting as watching a shuffleboard tournament (actually, even that has more skill points). 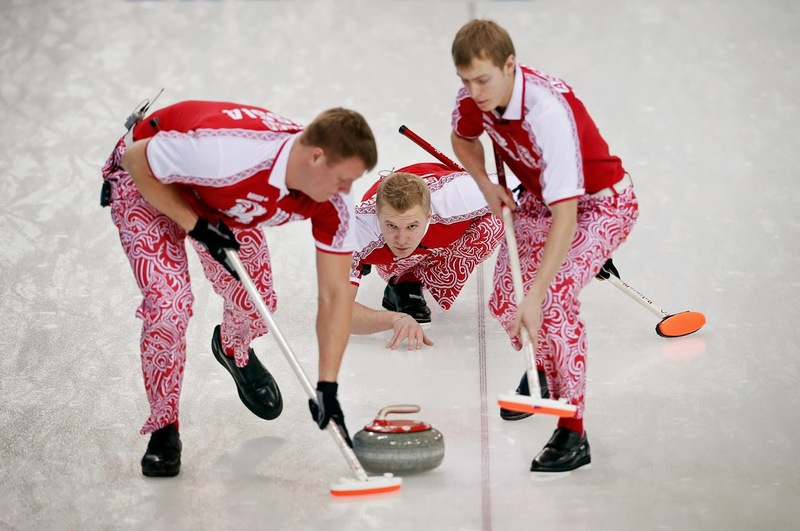 I'll have to give style points to the teams that had snazzy pants this year. 2. 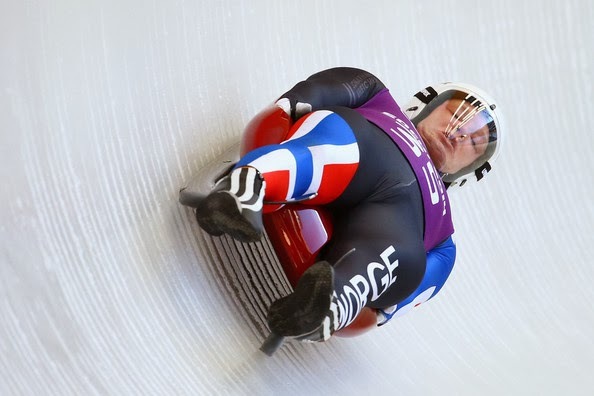 The Luge. Another stupid sport. This must have been started at some water park one winter day when the water slides froze and some kid accidentally slipped down and almost broke his neck. Hey ... let's put a sled under him and throw him back down again and see what happens. 3. Snowboarding. Okay, rip the wheels off the street rats' skateboards and see what they can do. Yep ... move to Colorado and do the same thing on frozen concrete. 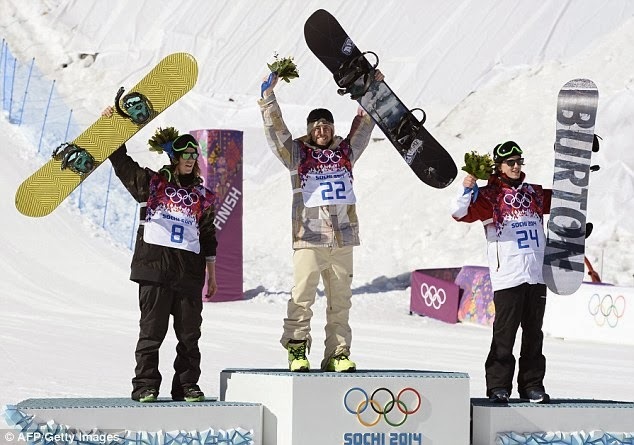 I forget ... is skateboarding a summer olympic sport? 4. Figure skating. Am I missing something here? Style points? 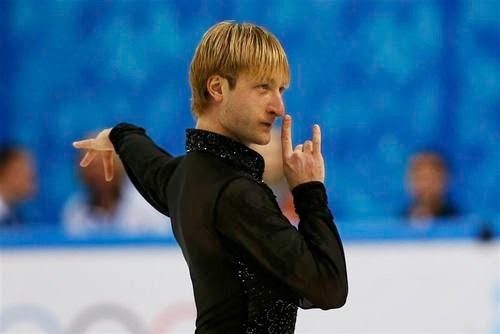 An over rotated lutz into a salchow? What the heck? 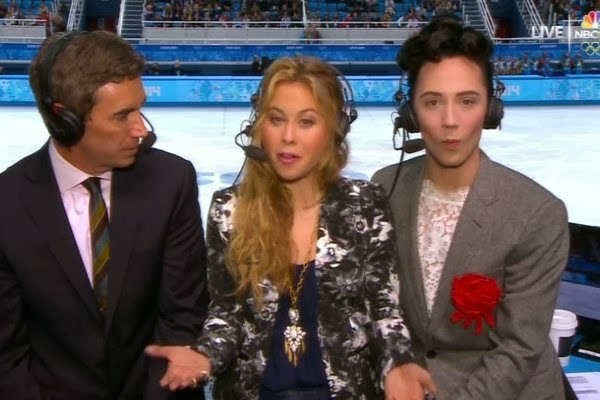 All I know is that the skaters that I did watch all fell and still won medals because their lutzes must have salchowed and I didn't realize it. 5. Commentators. Need I say more? 6. Ice Hockey. 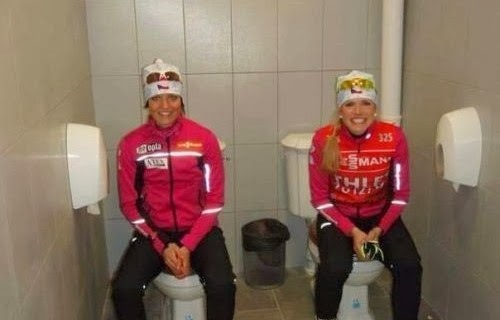 THE saving grace for the olympics as far as I'm concerned. 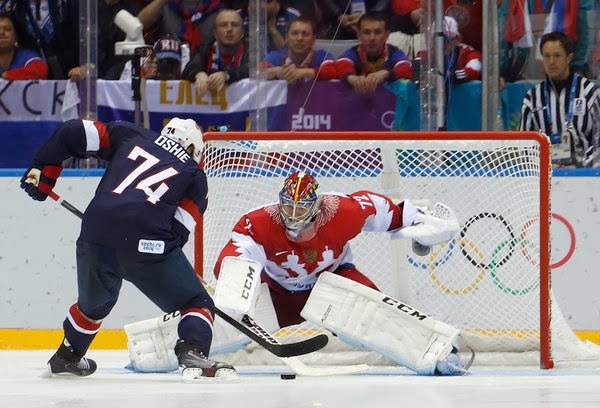 USA/Russia game ... fantastic. 7. 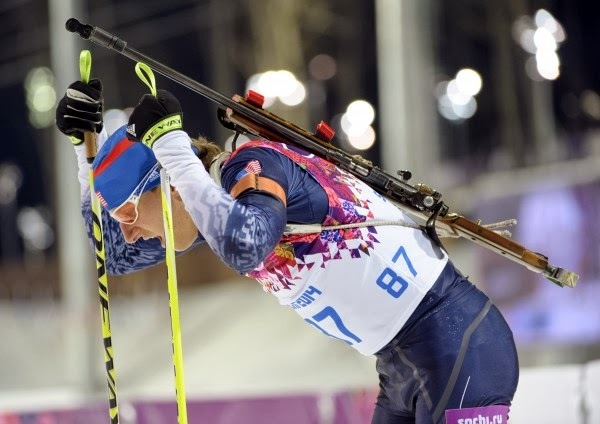 Biathlon. Ski and shoot, ski and shoot, ski and shoot. These guys all collapse at the finish line. It must be a brutally exhausting sport. Imagine if they really killed something and would have to carry it, clean it and eat it too? 8. Room accommodations in Sochi. Either they ran out of money to put up walls between toilets or they are truly a social-ist kind of place. Debbie would never put up with that. Especially with me as a roommate. Okay, I have to admit, I am not a reliable critic of the Winter Olympics. As a southern boy who grew up in the city, I didn't really spend lots of time on the snow in the mountains. 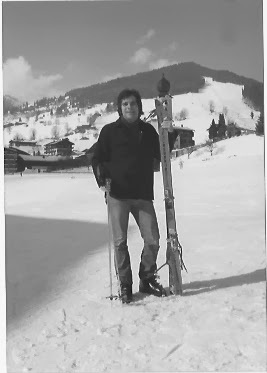 When I taught school in Austria, I tried my hand at skiing and was laughed off the mountain when I showed up in jeans with a black wool coat on. (I was cold a wet for days). Everybody else was wearing slick white ski suits. WHITE!!! Either they are so good that they know that they will never fall and have a search team look for them. Or it's easier to spot the blood when they hit a tree.